Jason Sims, a professional graphic designer received his B.A. in Communications from the University of California at Los Angeles and is currently the owner/animator of Coffeehouse Films. He is currently based in Jersey City, New Jersey. He splits his time between his graphics work, and the Rogo's Rim movie project..
Jason was born and raised in Philadelphia, PA. He grew up in a creative household and as early as age 13 he was making his own clay animated films then later foam latex stop motion puppets in Super 8 (the precursor to home video). His creative influences ranged fromthe films of Ray Harryhausen, almost any science fiction movie, movie soundtracks, and the creative influence of all members of his nuclear family. Coffeehouse Films developed out of Sims' passion to learn high-end, 3D animation programs while living in Los Angeles. In early 2007, he committed all of his time off between freelance gigs to focus on training with these packages. Jason on an almost daily basis would "schlep" his 17" iMac computer to the now defunct Border's Books where he would camp out at least 8 hours at a time in their coffee house. With access to internet, food, a movie theater upstairs and the fellowship of numerous regulars whom he bonded with, the coffee house locale to develop his skills was the perfect working conditions for project development. Currently in development is "Rogo's Rim ", a feature length sci-fi adventure epic featuring original characters created by Jason Sims. Jason continues to build a bridge between his print and graphics experience with his animation abilities. His project Rogo's Rim, incoporates his writing skills (as he is the screenplay writer), his modeling and animation work (as showcased in the Rogo's Rim book trailer) and his traditional design skills as seen in his packaging materials, web site and physical print book for Rogo's Rim. 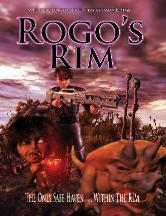 Feel free to get a sneek peek of the Rogo's Rim as we periodically update the site with sample clips and stills.